This Malaga Map shows popular Attractions, Places of Interest & Transport location . Click the name in the right column to highlight the location on the map. When you visit Malaga you will notice from almost any where in the town the impressive and magestic castle rising up the hillside near the harbour. The site is in fact 2 seperate castles with there entrances either at the bottom of the hill , next to the Roman theatre ruins for the Alcazaba Castle and palace, and at the other extreme end at the top of the hill is the entrance to the Castillo de Gibralfaro . 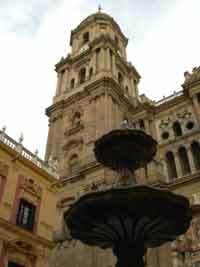 Both are well worth a visit and in my opinion the best attractions, along with the Cathedral in Malaga. For full details use the links above or read on. La Alcazaba a fortress & Palace built in 1065 the fortifications were built by the Moors, although earlier fortifications by the Phoenicians & Romans existed on the site. The Alcazaba is probably the most important castle that remains from the Arab occupation of Spain. After the capture of La Alcazaba some of the Catholic monarchs lived in the Alcazaba and King Philip IV was a guest there. In the early 1930s it was declared a national monument and luckily The Alcazaba was then restored, to the magnificent state it is now in. Near the La Alcazaba entrance is an Archaeological Museum and the ruins of the Roman Theatre , Teatro Romano . On the Open top sightseeing bus route stop number 10. On the Open top sightseeing bus route near stop number 10. Castillo de Gibralfaro is a moorish castle of Islamic architecture. The castle is perched high on top of a steep hill and has extended twin wall forming a corridor to the lower El Alcazaba castle. This castle was built in the 14 15th century, by the arab ruler Yusuf, to protect the lower Alcazaba Castle which had little defence from attack from the slopes above it by cannon. The walls zigzag, which gives flanking fire along the walls, and also to follow the contours of the hill top. A deep well was dug through the solid rock. There is a very small museum located on the site of the gunpowder magazine, and near the cafe. The museum contains a model of the castle and other intresting displays. There is a small terrace cafe within the castle, where I had the best tasting chicken tapas during my stay, and considering it's location quiet reasonable in price. The tapas had chicken, couscous and sultanas in it and was delicious. Unlike the kiosk by the bus stops which was quiet expensive. Open top sightseeing bus stop number 7 on the map. Opening Times: 10am to 6pm Monday to Friday. On the Open top sightseeing bus route stop number 11. 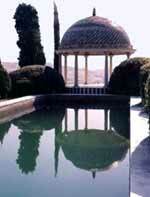 La Concepcion Garden are the most important tropical gardens in Spain, and possibly Europe. They are extremly beautiful and were created over 150 years ago. The town of Malaga purchased the private gardens and restored them and opened them up to the public. The museum houses a selection of manuscripts, paintings and sculptures. 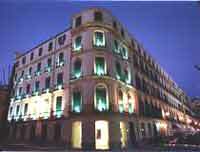 The Museo Picasso Malaga is situated in the Buenavista Palace, built in the 17th century and a wonderful example of renaissance architecture. 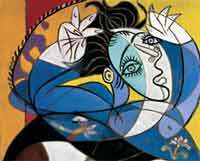 The Malaga Picasso Museum contains over 200 paintings, sculptures, drawings or other works of art. Also on display are Phoenician artifacts found when the palace was renovated. The Malaga Bullring located near the port in the la Malagueta area of the city was built in 1874.The bullring has a capacity of 14,000 people. 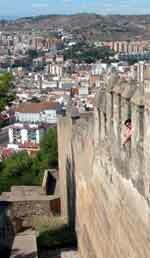 The photograph looking down into the bullring was taken from the castle ramparts. Opening Times: 10am 1pm & 5pm 8pm. On the Open top sightseeing bus route stop number 6. Large underground limestone caverns with stalagtites & stalagmites, pools and wall paintings. It was reputed that the ruler Tasulin Ibn Al hid gold here in the 7th century, but no treasure hunter has been lucky yet. The theater is now occasionally used for plays.